In this tutorial I will describe the steps to follow for getting started with writing Enhancement Engines (EE) for Stanbol 0.10.0-incubating. In general, writing an EE for Stanbol is quite easy, once you know about some important details about maven, OSGI, and Apache Felix – the aim of this document is to share you that details. Also, EE-s will be packaged using maven, which you can get from here: http://maven.apache.org/ . However, if you are using Ubuntu 12.04, like I do you can just install maven from the Software Centre, or with the command in the terminal : sudo apt-get install maven. This provides you with maven 3.0.4. The minimum version is 2.2.1, that is part of the Ubuntu 10.04 distro, and I can confirm that it also works. Fortunately, NetBeans has built-in support for maven, so no other steps are necessary. you probable should rather say -Xmx700M as with 512M I could manage to get out of heap space exceptions. It does not happen all the time, but once in a while. Compiling and packaging Stanbol will take a while, so be patient. Once Stanbol the mvn clean install command finishes without errors, you can carry on to the next step. Stanbol is built up from OSGI bundles. If you are not familiar with OSGI, do not worry, you will like it by the end of this tutorial. Like everything else, our Example Enhanement Engine will be written and deployed as an OSGI bundle. This will create you an OSGI bundle project with the an Activator class as shown below. We won’t rely on that class, because the service we are going to create will be registered not using an Activator, but using maven-scr-plugin. Therefore, we need to delete this Activator.java. This plugin will add an OSGI-INF directory to the jar file we are will generate. In that directory a descriptor will be generated that will register our EnhancementEngine after uploading the bundle to Apache Felix. Now we gonna need to add some dependencies to our project. First we add the stanbol-0.10.0-incubating jar. There is a 0.9.0 version that you can find in the maven repos, however, that is not good for us, so do not insert it into this project! Right-click on the dependencies folder of the project (not Java Dependencies! ), then click on the Add dependency item! After that, we can create the stub implementations of canEnhance, computeEnhancements and getServiceProperties functions. The Property named EnhancementEngine.PROPERTY_NAME is mandatory, the TRIGGER_STRING and the WIKI_URL are the parameters of our ExampleEnhancer. We will create a very simple enhancer, that if the incoming content contains the TRIGGER_STRING it will add an RDF triple that point to the WIKI_URL. In order to make the annotations work, we need some imports. This part will configure our simple enhancer to whenever the input contains “Polanyi” it should give a triple according to which the current document is about the philosopher Michael Polanyi. Don’t get confused, 3 of these 6 variables are defining the names of properties, the other define their default values. The private variable represent the actual values of the above variables, which we retrieve from at the Activation of the component. These indicates that we will enhance in a synchronous mode, meaning that the framework will wait until we finish processing. This is about the place of the Enhancement Engine in the Chain. Finally we go on implementing the computeEnhancements method. You will need to search for the dependency for UriRef and other classes in maven. If you want to use logging, use slf4j! Press right click on the project and select “Clean and Build”. This produces a jar file in the “target” directory of the project which contains your bundle. Now go to the console of your Stanbol instance! Under the bundles tab you can install your bundle into your system. 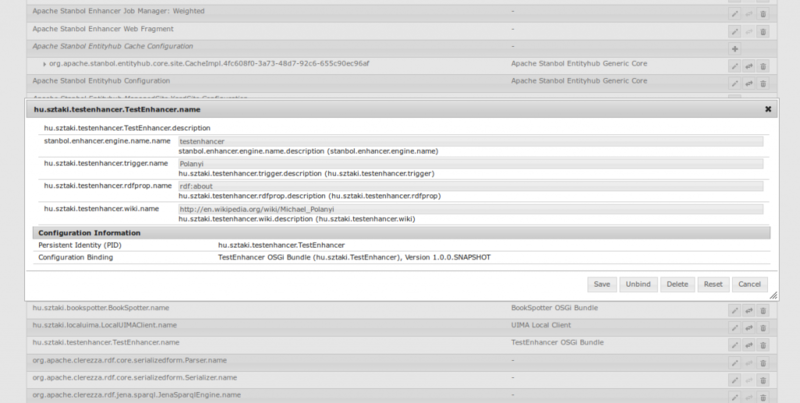 After the bundle is installed, you can configure your Enhancer on the Configuration tab. Your enhancer now should show up in the default chain!